“Prathi” and “Angira”, the terms mean “befitting reply” and “tantric cult and vamachara prayogas”. Goddess Pratyangira is believed to be the form of both shiva and shakthi. 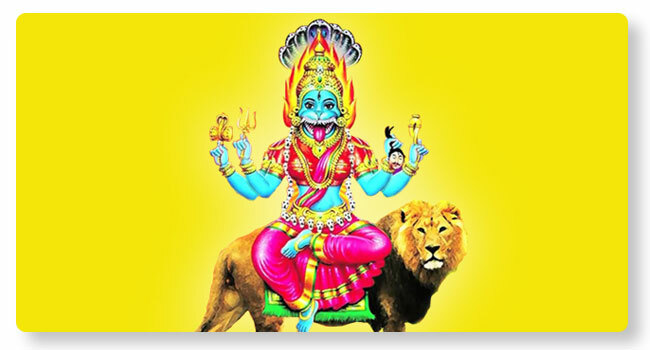 Goddess is also known as ‘Nrisimhika’ or the Lion-faced goddess. Pratyangira Devi is the swarupa of Dharma / righteousness and Satya / truth. She has the impeccable power to destroy the sins of her devotees and shield devotees from fears and harms. Pratyangira homa is believed to shield the kartha strongly from harmful elements, protect him from untoward incidents and gives him relief by destroying his all his enemies in one go. Pratyangira Homa can be performed in Shakthi Sthalas like Kolluru for best results. Pratyangira Homa has to be performed on a pre-decided day, with high levels of sanctity, under the supervision of learned priests. Elimination of Adhikarika prayoga (Fatal Vamachara prayogas like ‘PutthaLikA stHApana’). Relief from ‘Drishti Dosha’ or negative effects due to the jealous eyes of people. Improvement in health of the Kartha and revival of his self-confidence.